Whenever Mark and I travel, we keep one eye open for that perfect place. Too many vacation spots feel like a nice place to visit, but we wouldn’t want to live there. Many of our empty nester friends have already found their ideal locales and have dispersed. Some moved to better climates, to be closer to family or farther away, to experience city life or retreat to the country. Perhaps we are indecisive or just plain picky New Englanders, but nothing has grabbed us so far. Neither Santa Fe nor Seattle nor Sarasota holds allure. The closest we’ve come is Copenhagen. After returning from a vacation to Denmark, I shocked my friend Ann when I said, “I could live in Copenhagen.” So, what was it about Copenhagen? First, Copenhagen met our must-haves for a vacation spot—lively art and design center, fabulous food, a moderate climate and access to exercise. Then Copenhagen exceeded our list by showing us the wow factor—the lifestyle of a city designed for the health and well-being of its inhabitants. 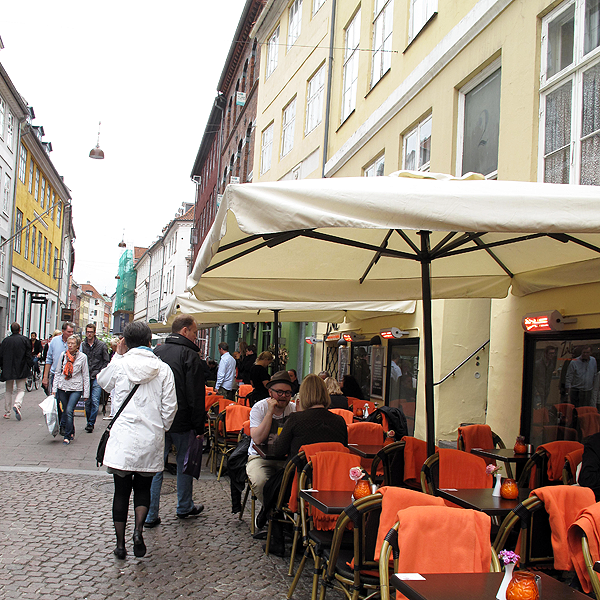 Copenhagen’s claim to fame has always been its clean, modern Scandinavian design. The city does not disappoint—from the Danish Design Museum to the National Gallery of Denmark to the Danish Architecture Centre to the local furniture shops like Helbak. Lately design has made room for foodies who flock to the city for foraged food and a nosh at Noma, the world’s best restaurant, which was a tad too pricey for our tastes. But we found terrific homemade Norwegian food throughout the city, which we also chose for climate. 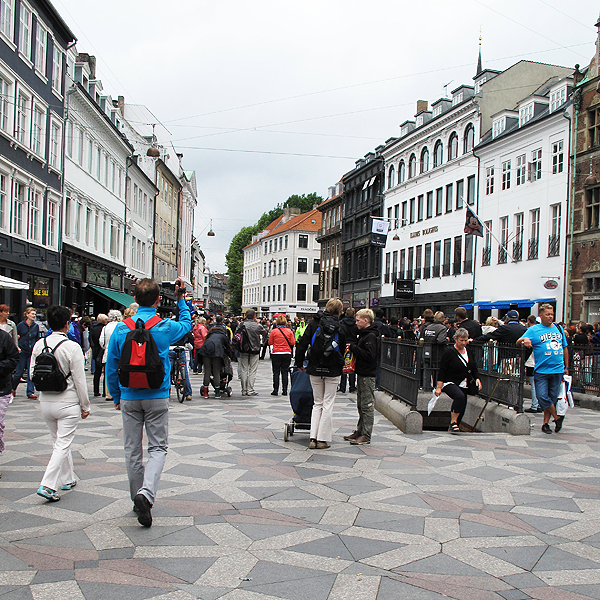 Mark doesn’t care for hot weather, so the similarity of Copenhagen’s weather to New England’s was a plus. But the real draw involved the Danes’ humanist approach to city planning—a design that prioritizes fitness, health and physical mobility. Copenhagen is a paradise for walkers, cyclists and runners because most Danes do not rely on cars. Unlike our car-centric country, pedestrians in Copenhagen have the right of way, followed by bicycles, followed by autos. Bike lanes line every street and 50% of the residents bike to work daily. The bikes we rented in Copenhagen were the kind of three-speed vehicles we remembered from childhood. Handle brakes. Comfy seats. Metal baskets. Shiny silver bike bells. Brrring. Brrring. 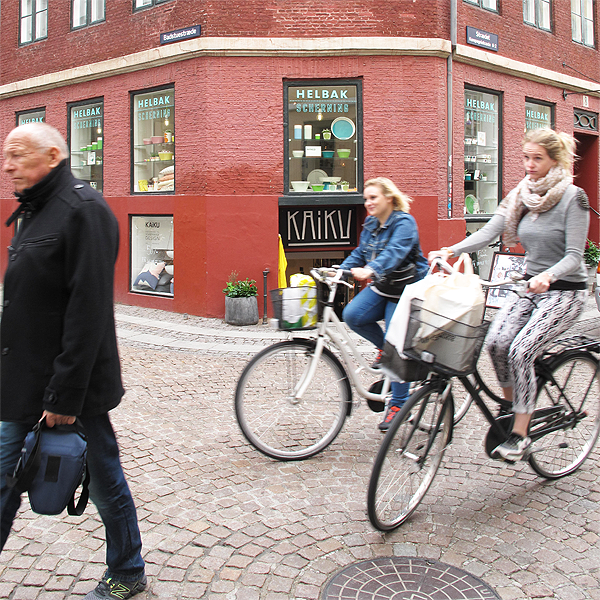 The pace of biking in Copenhagen was neither breakneck nor leisurely, but purposeful. Bike to market. Bike to work. Bike home. And Copenhagen is completely set up. Baskets to carry groceries. Carriers or trailers to cart children. Racks for parking. During our Copenhagen vacation, Mark and I replaced our daily trip to the gym with cycling, walking and running outdoors everywhere every day. We happily chose bicycles as our main mode of transportation for the entire trip. Not only were bike lanes available on all the city’s streets, but all the constituents (walkers, bikers, and drivers) followed the rules of the road. Stop on red; go on green. This adherence to the traffic laws made it extraordinarily safe to ride bikes in the city. Expectations were set; no road rage anywhere. And Copenhagen continues to improve the bikeways. In June 2014, Copenhagen opened a new bike skyway, an elevated roadway for cyclists over the harbor. Conversely, in our nation where car is king, the Center for Active Design reports that the explosion in obesity is a direct outcome of our ubiquitous, car-dependent neighborhoods. When the residents of Copenhagen were polled recently about their reasons for biking, 54% said cycling was “easy and fast,” 54% noted the need for “exercise,” 6% said cycling was “cheap,” 7% liked the “convenience,” and 1% wanted to save the “environment.” In their leisure time, Danes enjoy exercising in the proliferation of parks and beaches in Copenhagen. 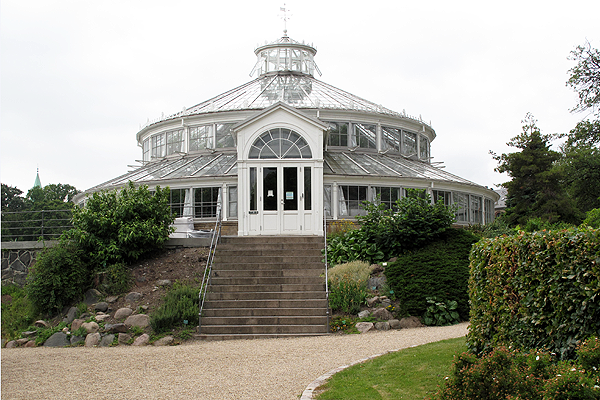 The circular Crystal Palace greenhouses at the University of Copenhagen’s Botanical Gardens in the center of the city are available to all, and the city plans to make it a priority that all residents can access a green area within 15 minutes of their homes by 2015. 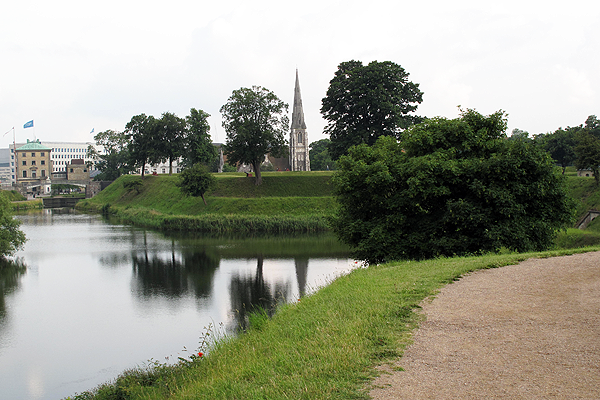 My favorite place to jog in Copenhagen was an elevated star-shaped running path at Kastellet, which was originally a fortress to protect the city. Each tip of the star holds a vista—the harbor, a church, a windmill, a fountain, a castle. Other green initiatives by Copenhagen city planners encompass an even more ambitious goal—to become the first zero-emissions capital in the world by 2025. The byproduct of this sweeping attention to fitness and health in Denmark is a happy population. The Danes got it right. From an evolutionary standpoint, humans were born to exercise. Our bipedal ancestors survived by walking, jogging and running away from prey and toward food. Emerging scientific data “suggests that we are clever today in part because a million years ago, we could outrun and outwalk most other mammals over long distances. Our brains were shaped and sharpened by movement, the idea goes, and we continue to require regular physical activity in order for our brains to function optimally,” according to the New York Times AskWell blog, Exercise and the Ever Smarter Human Brain. As for living in Denmark, the Danes I met in Copenhagen were bilingual and had such an excellent command of English, I could not tell they were non-native speakers. Even though I don’t know Danish, I still contend that I could live in Copenhagen—except that work, family and friends are here. So I have to ask myself, why don’t we have easy access to restaurants and shops? Where are our sidewalks and bike trails? Why do drivers disregard pedestrians and cyclists? How come road rage persists here, but is virtually nonexistent over there? Why aren’t our city planners making healthy communities a priority? Can Americans redesign cities to embrace walking and biking? Why can’t we learn from Danish design to create that perfect place? 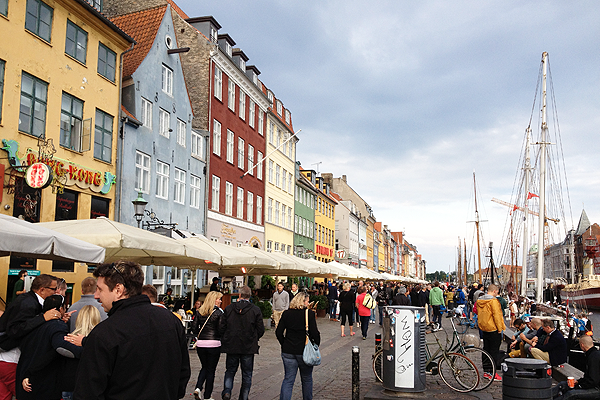 • Can America Embrace Biking the Way Denmark Has? This entry was posted in Architecture, City Planning, Cycling, Exercise, Health and tagged Architecture, City Planning, Cycling, Design, Exercise. Bookmark the permalink. 3 Responses to Choosing Copenhagen. I likе this post, enjoyed this one thankyou for putting up. Great Post! Love the way the streets align…so thigmotactically correct! Kudos!